What is “Over Dimensional Cargo” or “ODC”? Before we understand the technical definition to qualify a cargo as ODC, we need to understand that the need for defining ODC is to ensure the safety of the road users. By qualifying a cargo as ODC and imposing regulations over carriage of ODC, government’s aim is to avoid any unsafe practices and accidents. Whether the government has made the correct decisions and imposed correct regulations remains a topic for another day. In simplest terms, ODC or Over Dimensional Cargo is a cargo that protrudes outside the loading deck of the vehicle transporting the cargo. If a truck with loading platform length of 20 feet is loaded with cargo like TMT bars of length 22 feet, then the TMT bars qualifies as Over-Dimension Cargo. If the same TMT bars were loaded on a vehicle with platform length of 22+ feet, it would have been classified as Normal Cargo rather than ODC. This definition of ODC is to resist industry from transporting Normal Cargo unnecessarily as ODC for small economic benefits compromising road user’s safety. As discussed in our other article, “What are the costs associated with ODC?”, the government imposes fine on the carriage of ODC, hence incentivizing the industry to refrain from taking unnecessary risks and using larger vehicles to transport these loads. The above cargo qualifies as ODC as it protruding from the rear of the Open Truck. If the same cargo was transported on a trailer having a deck size of 40′ Trailer, it would have qualified as Normal Cargo. This definition is valid for length and width but what about the height? A cargo being higher than the body of the vehicle doesn’t make it dangerous. Hence for height we need to define the limits for defining ODC. 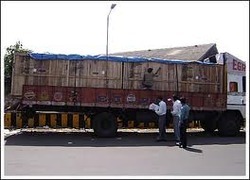 In CMVR (Section 93, Sub Section 2, Page No 68), Indian government defines the height limit for all mechanical trucks and trailers at 3.8 meters (12.46 feet) from the surface. This means that if you load a cargo of height 8 feet on a vehicle having a platform height of 5 feet, the cargo will qualify as ODC. In case of length and width too, the government has provided upper limits which are 12 meters length for Rigid Trucks, 16 meters length for articulated vehicles (also called Trailers) and 2.6 meters width for all vehicles (Refer CMVR Section 93, Page No 68). The length limits are for the overall vehicle, hence the loading deck will be of lesser length. Considering this upper bound, if your cargo is wider than 2.6 meters, it is qualified as ODC even if the loading deck exceeds the cargo width. The three cases defined above cover all the aspects of ODC definition. MAN prime mover attached to a low bed trailer of height 3 feet. 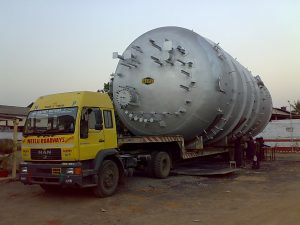 Load dimensions of 14m x 4.9m x 4.9m – 26 Tons. Neelu Roadways is a sister concern of Nimbus Logistics. The above is an example of an over dimensional cargo in all three dimensions ie length, width and height. Even if the loading deck was larger to match the length and width of the cargo, the cargo still would have classified as ODC being over the upper bounds defined in CMVR. There are two more definitions used in Project logistics related to ODC. These definitions though not defined by government, are regularly used in the industry to classify over dimensional cargo. 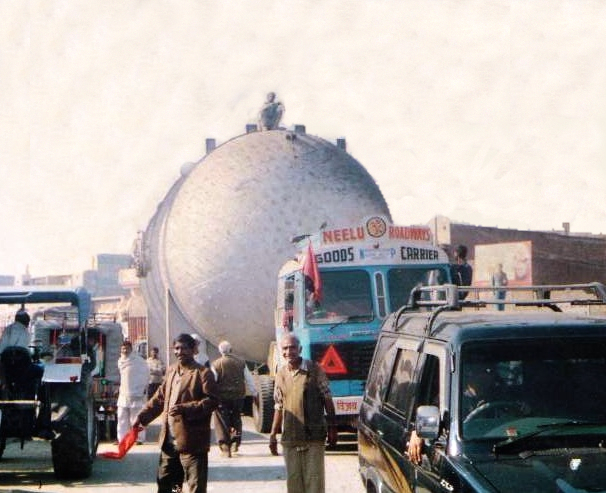 The above photo shows a critical over dimension cargo ad-measuring 4.8 meter in height being transported by Nimbus Logistics (Neelu Roadways is our sister concern) in 1989. In 90’s, there were a lot of low hanging electric wires which had to be lifted and lack of proper roads meant we had to built many temporary roads to reach the destination. 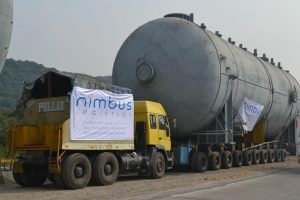 The above photo shows a 102 tons package of height 6.3 meters being transported over 10 rows Hydraulic Axles and a MAN puller by Nimbus Logistics. The above job was transported for one of our prestigious clients “Phils Heavy Engineering”. This photo is one of the testaments of our capability at transporting super over dimension cargo. Since the industry has seen many newcomers with little to no experience in the industry, there has been high rise in the accidents occurring en-route. The most common reason is the lack of basic safety precautions, poor knowledge of en-route obstacles and lack of workforce training. Nimbus Logistics has an extensive experience of over 4 decades in the ODC industry. In all these years we have developed an extensive database of en-route obstacles. Our workforce has a minimum experience of 15 years in transporting ODC. These strengths has helped us conquer all the areas of Project logistics, from ODC to Critical ODC to Super ODC with 100% error free record. To know more about us, download our Company Intro and Profile. To learn more about Project Logistics, read our next article: What is “Overweight Cargo” aka “OWC”?